Brand new condition! 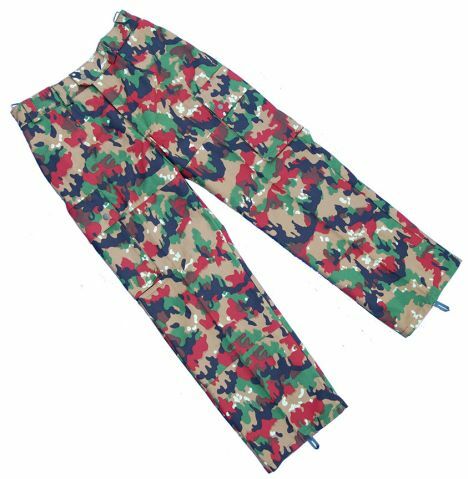 Tough Swiss Army Leibermuster or "Alpenflage" camo pants in 50/50% cotton/poly blend feature two front slash pockets, side leg cargo pockets with snap closure flaps, and a rear "velcro" sealed hip pocket. Waist band has belt loops and elastic for secure fit. Pair them up with our Swiss Army Alpenflage field shirts for a set. Great for paintball, hunting or casual wear. These vintage camouflage pants are getting harder to find in unissued condition like this. Order by options below. Longer inseams priced slightly more. While they last.